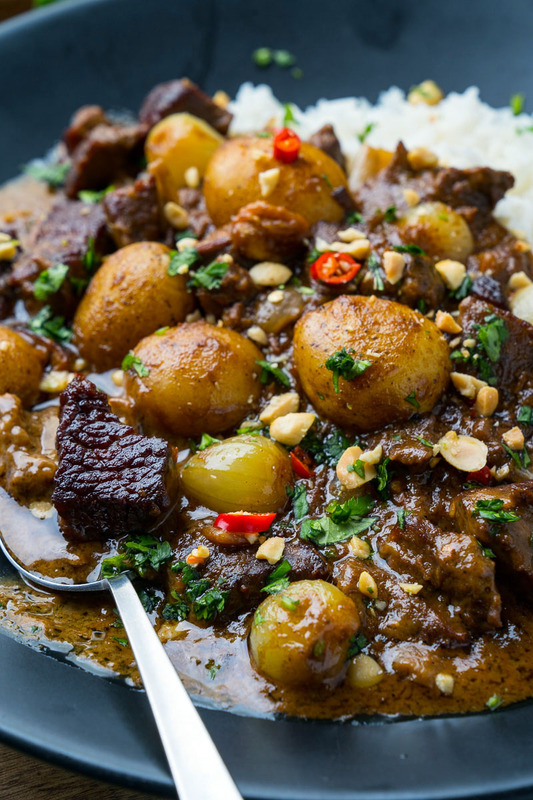 Melt in your mouth beef massaman curry that is so easy to make at home! 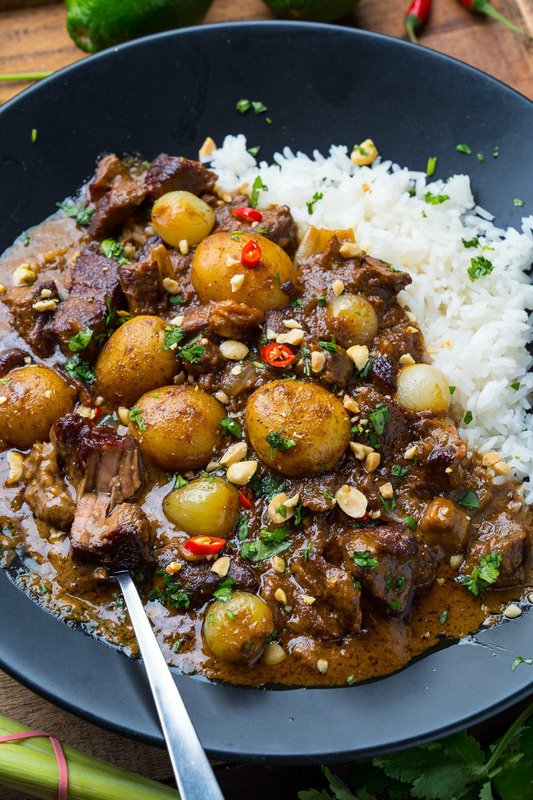 One of my favourite Thai dishes is this beef massaman curry which is pure comfort food! 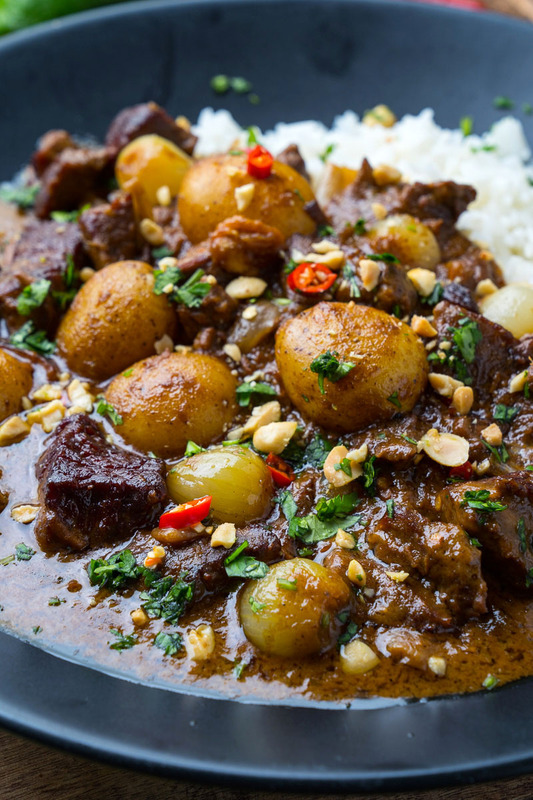 Massaman curry is a little different from other Thai style curries in that it contains several warm spices not found if your typical Thai style curry including cinnamon, nutmeg, cloves and turmeric which give it such an amazing aroma! 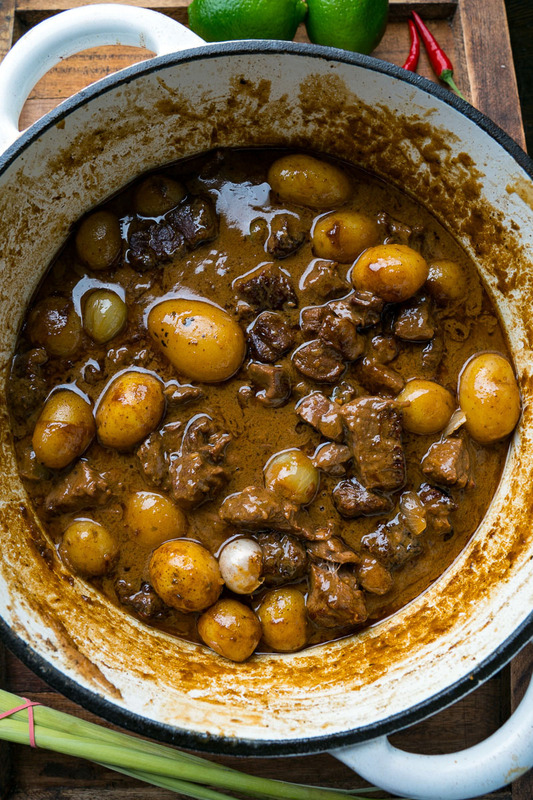 I start out with a homemade massaman curry paste that is just bursting with flavour and I like to use beef which is slowly braised in coconut milk until it’s melt in your mouth tender! This curry is filled out with potatoes and onions and it has a hit of peanut, in the form of both peanut butter and a chopped roasted peanut garnish. This curry follows other Thai style curried in that it has a base of coconut milk along with a balance of spicy curry paste, sweet palm/coconut sugar, salty fish sauce ans tart tamarind and lime which is just divine! 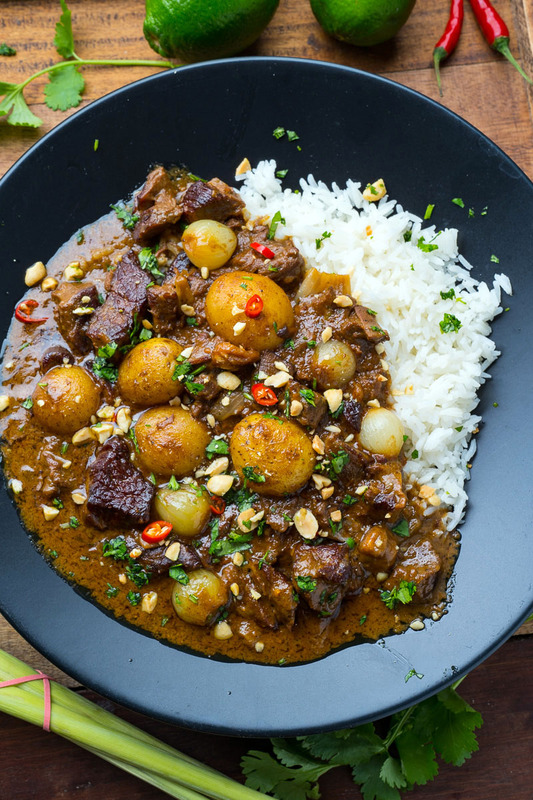 Serve a big bowl of this massaman beef curry by itself, over rice or with naan to scoop it up! Heat the oil in a large heavy bottom sauce pan over medium-high heat, add the beef and cook until browned on all sides, about 10 minutes. Add the curry paste and cook until fragrant, about a minute. Add the beef broth, coconut milk, peanut butter, tamarind paste, fish sauce, and sugar, bring to a boil, reduce the heat to medium-low and simmer until the beef is falling apart tender, about 2 hours. Add the potatoes and onions and cook until tender, about 15 minutes. Add the lime juice and check the seasoning. There should be a nice balance of saltiness from the fish sauce, sweetness from the sugar and tartness from the tamarind and lime. Adjust to taste. Serve garnished with the peanuts and cilantro. Slow Cooker: Optionally implements steps 1 and 2 and place everything up to, and including, the sugar into the slow cooker and cook on low for 8 hours or on high for 3 hours, before adding the potatoes and onions and cooking on high until tender, about 15 minutes. Continue on with steps 5 and 6. Option: Omit the tamarind paste if you can’t find it. Option: Garnish with sliced red chilies, such as bird’s eye chilies! You really need to be specific about what kind of dry chili’s for th MSsaman curry!